Tetanus spores are everywhere. In dust, in dirt, everywhere. In most circumstances, tetanus spores are not only harmless, they are helpful. It was learned in the 1920’s that ingestion of tetanus spores creates natural immunity that is strain specific. Through everyday activity, you ingest tetanus spores and thereby develop natural immunity to the strains of tetanus in your local environment. Tetanus is “anaerobic” — it is inert in the presence of oxygen. Tetanus is only a problem if it gets deep into certain types of wounds in the right conditions. Irritating and provoking substances such as dirt or shards of glass or wood must be present that prevent the wound from quickly healing and allow it to fester. Wounds that bleed, that are properly cleansed, that are soaked, and other various methods of proper treatment do not create an environment for tetanus spores to become toxic. Natural immunity can be overwhelmed by extreme wounds, such as soldiers experience in war. Soldiers may also be wounded in foreign lands before they have had the chance to develop natural immunity through ingestion of the local strains of tetanus. Vaccination creates one type of antibody in the blood called “antitoxin” that differs from the “agglutinin” type of antibodies formed by ingestion. Antitoxin antibodies are in the serum (blood) and they can’t neutralize tetanus toxin unless the toxin gets to the blood. If the toxin gets to the nerve endings first, such as what happens in deep dirty puncture wounds, or wounds that are untended such as during battle, the nerves transport the toxin to the brain, no matter how high the vaccine-induced serum antibody level. If tetanus is diagnosed (based on symptoms) tetanus immune globulin (which is the antitoxin in vaccines but delivered directly to the wound) may be given, but just like the antitoxin antibodies in your serum (if you were vaccinated), the globulin can neutralize only toxin that hasn’t yet bonded to nerve tissue. One situation does occur in which serum antitoxin levels actually do have the ability to prevent infection and that is neonatal infection during or shortly after childbirth. The umbilical cord has no nerve endings, so antitoxin in the blood will bind with tetanus toxin and thus be neutralized. The presence of maternal and neonatal serum antitoxin is not a guarantee against infection, however. Studies have shown infections can still happen. Neonatal infection is completely avoidable with sterile birthing conditions that keep the umbilical cord clean. A clean birthing environment reduces risk of neonatal infection to zero. The safety of vaccination during pregnancy has not been established. Longterm impacts of the aluminum adjuvants on the developing fetus are unknown. A great article by immunologist Dr. Tetyana Obukhanych, along with citations, can be found HERE. Was tetanus-infection ever a major threat in the United States? 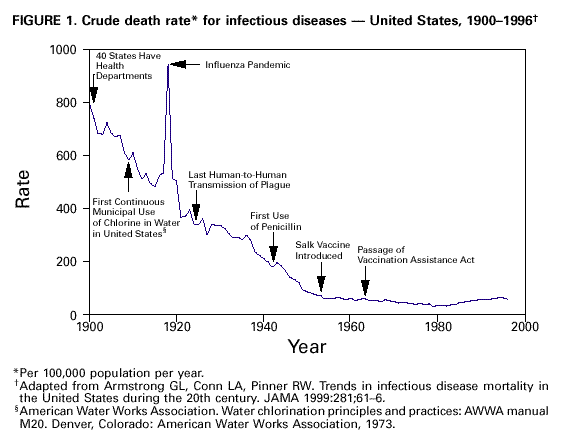 Were deaths due to infections common? While infection can be very serious, and once were fatal, it has also historically been rare in the United States. CDC estimates that in the 1920’s, about 1,300 people a year were infected with tetanus, based on the number of reported deaths and a 90% fatality rate. By 1947, before universal vaccination for tetanus began, U.S. tetanus cases had dropped to just 4 per million per year through better living conditions and better medical attention to wounds that created less opportunity for infection. Fatalities were 3.5 per million.